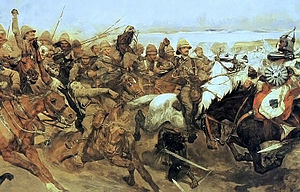 Depiction o the Battle o Omdurman (1898). The Mahdist War (Arabic: الثورة المهدية‎ ath-Thawra al-Mahdī; 1881–99) wis a Breetish colonial war o the late 19t century, that wis focht atween the Mahdist Sudanese o the releegious leader Muhammad Ahmad bin Abd Allah, wha haed proclaimed himsel the "Mahdi" o Islam (the "Guided One"), an the forces o the Khedivate o Egyp, ineetially, an later the forces o Breetain. Aichteen years o war resultit in the jynt-rule state o the Anglo-Egyptian Sudan (1899–1956), a condominium o the Breetish Empire an the Kinrick o Egyp. ↑ Meredith Reid Sarkees, Frank Whelon Wayman (2010). Resort to war: a data guide to inter-state, extra-state, intra-state, and non-state wars, 1816–2007. Washington, DC. This page wis last eeditit on 1 August 2017, at 00:58.